For some people chores are a draining obligation and they might have a hard time keeping up with or maintaining them in the way they probably should. For others these things come naturally and are almost useful in keeping them distracted from their thoughts. 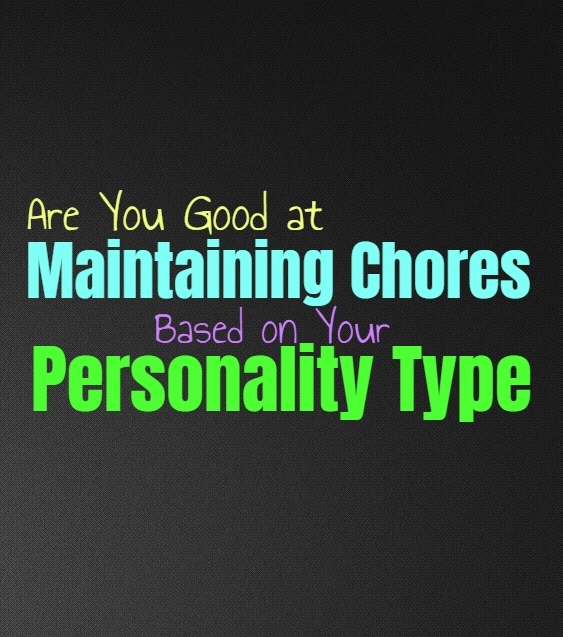 Here is how good you are at maintaining chores, based on your personality type. INFJs who live in a household where it is required of them to keep up with chores, will certainly do their best to follow through. They don’t like falling behind or being someone who doesn’t meet their expectations. They don’t usually enjoy feeling this sense of obligation to certain chores, but they do their best to keep up with these things since they don’t want to disappoint anyone else. INFJs can sometimes use chores as a means of letting their minds wander while they perform these mundane tasks. ENFJs are often great at maintaining and keeping up with their chores, since these things are somewhat important to them. While they don’t necessarily enjoy doing chores, ENFJs care about being someone who keeps up with everything and doesn’t let themselves fall behind. They are perfectionists and so for them these tasks are something they need to work hard on and ensure that they don’t make any mistakes in the process. INFPs don’t usually enjoy maintaining chores, since they dislike feeling this sense of obligation and time restraints. They would rather feel free to do things on their own terms, which is why they do often enjoy having their own space. At the same time INFPs do sometimes need people who can motivate them to get certain chores done, since they don’t mind leaving them to the very last minute and will find ways to compensate for this. ENFPs really don’t enjoy feeling obligated to take care of and maintain chores on a daily basis. They do get into a rhythm with these things though, especially if it is a chore they know they have to take care of. ENFPs just want to feel appreciated when they take care of household chores, since it does take a bit of effort for them to maintain these things with a certain predictability. Some days the ENFP just doesn’t want to feel obligated to do chores, and so in these instances it becomes difficult for them to keep up with it. INTJs don’t like falling behind with things and so they do their best to maintain the important chores. For them these types of things can be a little bit draining though, since there are so many other things they prefer to focus on. INTJs do their best to get into a schedule with these things, so that they can perform their important chores and maintain them without falling behind or allowing themselves to lose that sense of organization. While ENTJs are organized people there are times when certain chores can feel a bit draining for them. If they find their minds going in a different direction they might struggle to keep up with certain chores. They can become distracted by the things which seem much more important for them and in these instances the ENTJ doesn’t care much about meaningless chores. When they get into a schedule with things it becomes much easier for them to maintain all of their household chores with ease and efficiency. INTPs really don’t enjoy maintaining chores and can struggle to keep up with them most of the time. They become distracted by their thoughts and the things which are far more interesting to them. Feeling obligated to maintain some sort of schedule and take care of chores, can feel a bit boring and draining for them. INTPs do care about maintain certain chores but that doesn’t make it any easier or more interesting for them. They can often find themselves falling out of the schedule and struggling to really maintain it. ENTPs really don’t enjoy feeling obligated to maintain chores, and so this is something they can easily procrastinate. ENTPs are masters of putting things off, and don’t mind finding ways to procrastinate about doing chores. They will usually get things done when they are truly important but they don’t enjoy feeling like they are being forced into this. For the ENTP maintaining chores in a certain manner can certainly be challenging. ISTJs are excellent at maintaining chores, especially when they are important. They work hard to get things done and want to be efficient and focused people. For them chores are simply part of the things they need to accomplish on a daily basis, and they actually enjoy feeling a sense of accomplishment when they are finished. ISTJs will often set a schedule for when they get certain chores done and so maintaining them can be really natural for them. ESTJs are often great at maintaining the more important chores in life, and will do their best to keep up with a specific schedule. For them it is important to keep up with and maintain these things, since they want to be able to keep everything in their lives together. There are some chores that the ESTJ might actually struggle with though, and these are often the ones which seem less important than work or chores which they have to do daily. ISFJs are often excellent at maintaining chores and ensuring that they are done in a timely manner. They often keep a schedule for these things since they don’t like to fall behind. ISFJs usually find themselves taking care of themselves and everyone around them, and so chores are important in making sure everyone is happy and cared for. They are practical people, and so maintaining their schedule helps the ISFJ get things done. ESFJs really want to be able to maintain certain chores, especially when it comes to caring for their loved ones. ESFJs generally prefer organization but they can lose focus on certain chores which most people don’t expect of this type. When they have bigger and more important things to focus on as far as taking care of loved ones, they often forget to maintain certain chores and lose interest in them. When things are simple in their lives and everyone is cared for, the ESFJ becomes excellent at maintaining chores. ISTPs don’t really like the idea of chores or having to maintain things like this. It can be challenging for them to live with other people since they enjoy their independence. This doesn’t mean that ISTPs aren’t capable of maintaining certain chores, it just depends on the specific chore and its importance to them. They are naturally problem solvers and will keep up with things which matter most to them. ESTPs can struggle with maintaining chores and might have a hard time keeping up with a schedule. Most of their household chores can get left for a long period of times, with so many excuses as to why they cannot complete them. ESTPs simply struggle to keep up with these things because they become distracted and don’t like feeling obligated to things which bore and drain them. ISFPs aren’t fans of chores and can really struggle to maintain them. They become distracted and have a hard time keeping up with things which aren’t interesting to them. When it comes to chores ISFPs definitely struggle to maintain them and keep with some sort of schedule. This can cause tension between them and people they live with, but that doesn’t make it any easier for them to change this. ESFPs aren’t really great at maintaining chores unless they feel this is necessary in order to please others. Even then they are willing to blow off these chores and a schedule if they are inspired or excited by something else. ESFPs become distracted and don’t like feeling obligated to do the boring things in life when there is something much more excited which could occupy their time and energy.